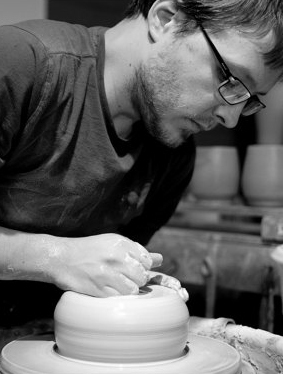 Nick DeVries has been working in ceramics for the past 10 years. Nick studied at St Johns University where in 2001 he finished a Bachelors Degree in Art, with a concentration in painting and ceramics. During his years in college he also worked with St. Joseph potter Jim Loso, where he developed a strong sense of design and balance which persists in his work to this day. Since his college years Nick has worked as a production potter for a local pottery, taught courses at the Edina Art Center and Northern Clay Center, and has pursued his own studio ceramic work. Nicks work has a strong foundation in functional forms: teapots, pitchers, cups, and bowls. Evident in his pots is a tight adherence to smooth consistent lines, strong curves, steadiness and balance. Open expanses of lightly textured surfaces are broken up by small adornments and the slightest of markings. Nick enjoys working in a reductive manner, throwing thick forms on the wheel and then carving and rasping these forms away to reveal the final shape. This process often leaves behind a subtle surface to his work, leaving tactile and sweeping linear textures. Nicks pots are finished with layered satin glazes. His focus is to create pots that have both a direct and complete shape, while at the same time staying responsive to the clay and glaze.